And all we build will crumble in an afternoon, but I know we will be home soon where we can dream once again. Wasted Wine’s sound has changed over the years and remains hard to classify. Much of their work shows the influence of frontman Robert Gowan’s classical background (especially his fondness for Bela Bartok and Kurt Weill) and co-founder Adam Murphy’s lifelong fascination with 1970s continental progressive rock obscurities (Ange, Alusa Fallax, Malicorne, Celeste), as well as a resolutely homemade, DIY approach to recording. Elements of doom metal, mid-century country music, psychedelia, hip-hop, and film music have made regular appearances. Songs often feature Eastern European and Middle Eastern style melodies and harmonies, unpredictable arrangements, and cryptic lyrics delivered in theatrical style. Listeners have used terms like “gypsy” and “cabaret” to describe the sound, while some writers have invoked artists such as The Decemberists, Tom Waits, Leonard Cohen, or even Gogol Bordello. Wasted Wine is a band based in Taylors, South Carolina. Originally established in 2006 as an acoustic “chamber folk” duo, the band has expanded over the years, picking up new members and performers. 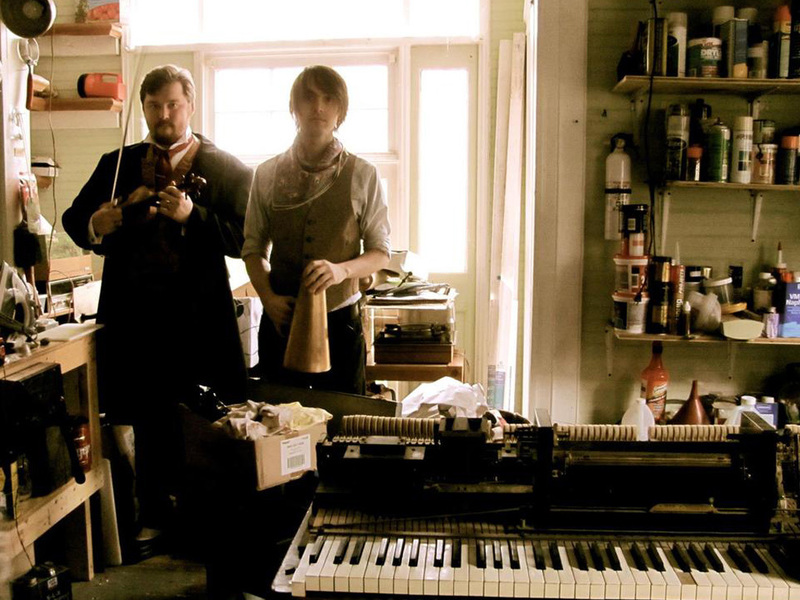 In the beginning, Robert Gowan and Adam Murphy wrote and performed hundreds of sparse, intricately arranged songs in coffee shops and small listening rooms in the Greenville, SC area. In sharp contrast to the guitar-slinging singer-songwriters that usually inhabited such spaces, the typical Wasted Wine show in this era found the two members lost on stage amidst a sea of nonstandard acoustic instruments–harmonium, bouzouki, bulbal tarang, nose flute, tuned wine glasses, glockenspiel, and percussion. Eventually, spurred by a desire to move beyond the folk scene, Wasted Wine took the next step, inviting other members in to play and help realize the increasingly elaborate sound that Gowan and Murphy had been honing through years of multi-tracked home recording. Wasted Wine never abandoned its founders’ love for acoustic instruments, though, and began using the 3-piece rock band format as a new, harder-edged foundation for the duo’s instrument-hopping proclivities. Sometime in the late 2000s, Gowan and Murphy found their first long-term sympathetic musical collaborators in guitarist Buck Dollars and bassist/vocalist Lou Buckingham. Originally another folk duo in the same vein as Gowan and Murphy but with backgrounds in punk and alternative rock scenes, the new members brought a new strength to the group’s sound. Dollars himself became a kind of mascot for the band, typically appearing in extravagant thrift-store garb with a signature hat displaying a dollar sign made from shredded money. After frustration with the conventional sensibilities of area drummers, the band found its first long-term percussionist in Judy Wong, a previous non-musician who under the bands’ direction proved a capable, creative compliment to the group’s peculiar sound. Major changes occurred when Murphy moved to New York City in late 2009, prompting Gowan to take the lead as the band’s sole front man. Behind the scenes, though, the two founders continued to collaborate long-distance at the same prolific rate that characterized their early days, adding to an enormous backlog of songs and home recordings that continue to trickle out in the band’s repertoire and on albums and mixtapes (the group has a long history of releasing loosely-assembled, freely available compilations of non-album material, the most recent of which is The Earth Rejects Creation 3, released Halloween 2014). Murphy continued to perform occasionally with the band and joined Gowan, Dollars, Buckingham, and Wong for the sessions that eventually produced 2014’s Wasted Wine vs. the Hypnosis Center. Shortly after recording finished, Wong departed and was replaced by current drummer Tim DeLisle. In its current incarnation, the band consists of front man/violinist/multi-instrumentalist Robert Gowan, guitarist Buck Dollars, and bassist Lou Buckingham, with occasional appearances by wayward vocalist/multi-instrumentalist Adam Murphy. Live, the band is often accompanied by Discordia Arts, who add theatrics, dance, fire, and more. Wasted Wine has performed extensively in and around the Greenville, SC tristate area (GA, NC, SC) and various venues up and down the east-coast. Self-recorded and prolific, the band present a deeply unique sound that resists categorization.